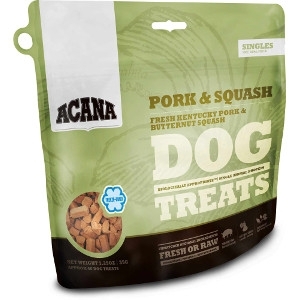 Loaded with goodness and full of natural flavor, ACANA Pork & Squash Treats contains one single, easily digestible animal protein and rewards your dog according to his evolutionary needs. Raised on Kentucky farms, our Yorkshire pork arrives fresh at our DogStar® kitchens, where it is gently freeze-dried then paired with fresh, locally grown butternut squash and sarsaparilla root to create a richly nourishing treat for your cherished dog. INGREDIENTS: Pork, butternut squash, pork liver, sarsaparilla root, mixed tocopherols (preservative).